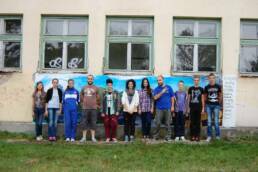 3 Great Waves of Ozren – The Street Art Workshop, realized as the part of the Art Network Project of the World Vision. It includes 3 municipalities around the mountain Ozren – Banovići, Petrovo and Poljice. The participants of the workshop were students of the primary and secondary school. The goal of the workshop was to introduce Street Art as a way of communication between students and local community. The students were also introduced to the concept of Socially Engaged Art by my colleague, Emir Kapetanović. The workshops were organized by Iskra Tabaković, Child Protection and Participation Lead WV BiH. On behalf of the Primary School Grivice, Banovići, our host was Aida Konaković, a biology teacher and a leader of Ecology Club. The initial goal was to paint a message to the local community about the current problems and also to find a solution for those problems. Each student started the drawing/problem on their own and then we tried to recognize the repeating problems and symbols that are occurring in the description of those issues. The problem that was recognized the most was drinking pipe water, that was muddy because of the rain last night, and this was a recurring problem because of the bad and old watering system. I started working on the Great Wave to break the ice, and pretty soon everyone was working both on the Great Wave and a collective mural. I liked this breaking line of the wall, like folded paper, and I tried to emphasize it by rendering the lower part of the Wave darker. Corruption in municipal government (presented by the symbol of the golden chair above the pipe) will lead to pollution and it can only be fought by the students who are attending schools that encourage imagination. I would also like to give thanks to all young artists involved in making this piece. 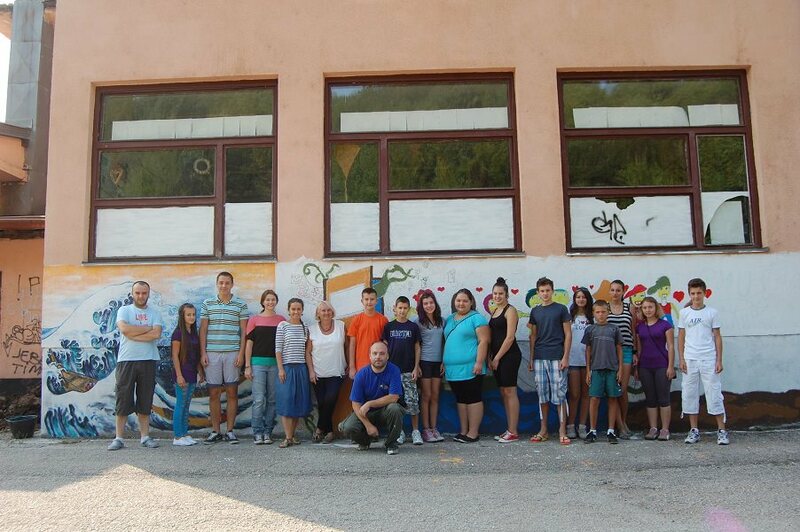 It was strange to find out that the walls of the Primary School Vuk Karadžić were clean and only two badly done graffiti by local hooligan group were standing out. Inside the school the walls were painted and it was done in a socialist/naive tradition of school decoration that I find very attractive and it was sad that that tradition hadn´t been kept. The main message comes from the central character of the child who is thinking about children’s rights. That’s why I tried to use the Great Wave, in this case, to represent children’s imagination. My assistant on this piece was Dragan Gajić, thank you for your good work. Poljice is a village on the bank of the largest artificial lake in Bosnia, Modrac. The lake Modrac used to be a summer destination for the Bosnians after the war, but undeveloped sanitary sewer system and illegal dumps caused raise in pollution of the lake, which caused all development of the region as touristic destination to stop. Also, it looks like it´s been forgotten by local government. Depression can be sensed in villagers’ interaction with their surroundings. While the gardens that surround houses remain clean, the streets are filled with garbage. Illegal logging sites and dumps are just sending message of the local bitterness. Primary School Poljice, where we had our workshop looked like abandoned school from the Silent Hill video game series. The roof and wall filled with cracks, size of the fist, looked discouraging for any type of wall intervention. It just screams for reconstruction. I had to apply 5 layers of white just to hold plaster together. On the first day of the workshop we hardly broke the ice. The second day was better. I decided to merge the Great Wave entirely into composition, and we all worked together on creating clear message from the kids to the elders, the message of change that is needed for municipality to get healthy again. And luckily, there is hope, Youth Association of Poljice is working on this issues. The design of the entire mural looks like naive art, which is perfect for the wall of any school. I wish I could come back and work on something new with kids from Poljice, on repaired and rebuilded school.